HOUSTON, March 27, 2019 -- GulfStar Group ("GulfStar") is pleased to announce the acquisition of GDS Holding, Inc. ("Global" or the "Company") by Moran Environmental Recovery, LLC ("MER"). GulfStar served as the exclusive financial advisor to Global throughout the transaction, which closed on February 26, 2019. Founded in 1979 and headquartered in Seattle, Global is an international leader in the marine services industry with decades of experience managing complex, critical, and technical projects in and around the water. Operating in some of the most challenging environments, the Company's skilled and seasoned professionals offer clients five core services: marine construction, casualty response, environmental services, commercial diving, and energy services. The Company has six locations in the western U.S. and serves clients both domestically and abroad. Global will continue to operate under its current brand as a wholly-owned subsidiary of MER. "GulfStar did a fantastic job from the start in understanding our company and then in finding the right buyer," said Tim Beaver and John Graham, the majority shareholders of Global. "They followed through until the transaction was complete, keeping an eye on every detail. Global has endured and grown over four decades of changing markets, technologies and economies by maintaining a consistent approach to safety, reliability and high quality work. Throughout, it has been the people that have held that vision, performing under the most strenuous and difficult conditions with smart management, reliable gear and journeyman skill. For these people, we are very grateful. Global has also been very fortunate to have developed strong partnerships over the years. We are very grateful to all the people that made this transaction a success and especially to GulfStar for making it happen." MER, a subsidiary of Moran Towing Corporation, is an integrated supplier of environmental, industrial, mechanical, and commercial diving services. MER entered into the commercial diving industry in 2014 with the acquisition of Eason Diving & Marine Contractors, Inc. in Charleston, South Carolina, and then in 2015 with the acquisition of Mainstream Commercial Divers, Inc. in Murray, Kentucky. 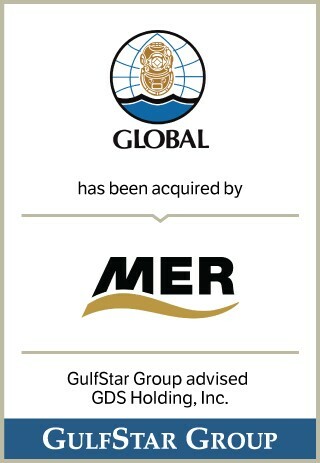 The acquisition of Global further complements MER's strategic position in the marine infrastructure sector. "We have known the owners of Global for more than 10 years and have enjoyed watching their company evolve from a local diving contractor into a major marine infrastructure services provider," said Kent Kahle, managing director of GulfStar. "This is a very strategic acquisition that should greatly benefit the stakeholders of MER and Global. We found the best buyer for this wonderful client." The GulfStar team was led by Managing Directors Kent Kahle and Brian Lobo along with Senior Vice President Rupert Gerard, Associate Sarah Wilson, and Analyst Tyler Woodby. For additional information, please email kkahle@gulfstargroup.com or blobo@gulfstargroup.com. GulfStar is a leading middle market investment bank headquartered in Houston. GulfStar specializes in providing merger and acquisition advisory services, institutional private placements of equity and debt, and general corporate finance advisory services to companies with revenues or enterprise values generally ranging from $25 million to $350 million. Since its formation in 1990, GulfStar has completed more than 675 transactions in 35 states and 16 foreign countries across a variety of industries.